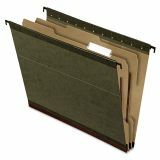 Pendaflex SureHook Reinforced Hanging Folder, 1 Divider, Letter, 1/5 Tab, Green, 10/Box - Hanging Divided Folder features a built-in 17 pt. 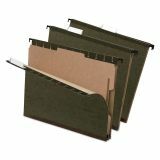 Kraft divider with dual fasteners to separate and hold related documents in place within the same folder. Folder expands up to 2" to accommodate bulky files. Top lamination adds strength and durability.